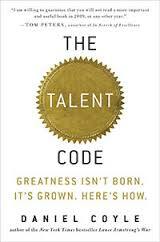 The Talent Code examines the details of exactly how great skill is developed. There is more science to this than you might imagine. As a matter of full disclosure, I haven’t finished the book yet. But I’ve read enough to be able to tell you that I think it would be worth your time to check it out. You will find out a lot about the topic of developing the skill you seek. And I’m pretty certain that some of the information here will surprise you. Skill is not something you are born with. Great athletes are not born with genetics that are superior to you. Great musicians are not born with music in their blood. All of the skill is developed through focused, repetitive work and practice. There is real science that has been discovered in the formation of skill. These new discoveries are related to the physiology of what happens in one’s body while practicing. Note that this science has nothing do with born ability. The specifics of how you practice is very important. If you are serious about becoming a great drummer (or becoming a great artist in almost any discipline), you must read this book.